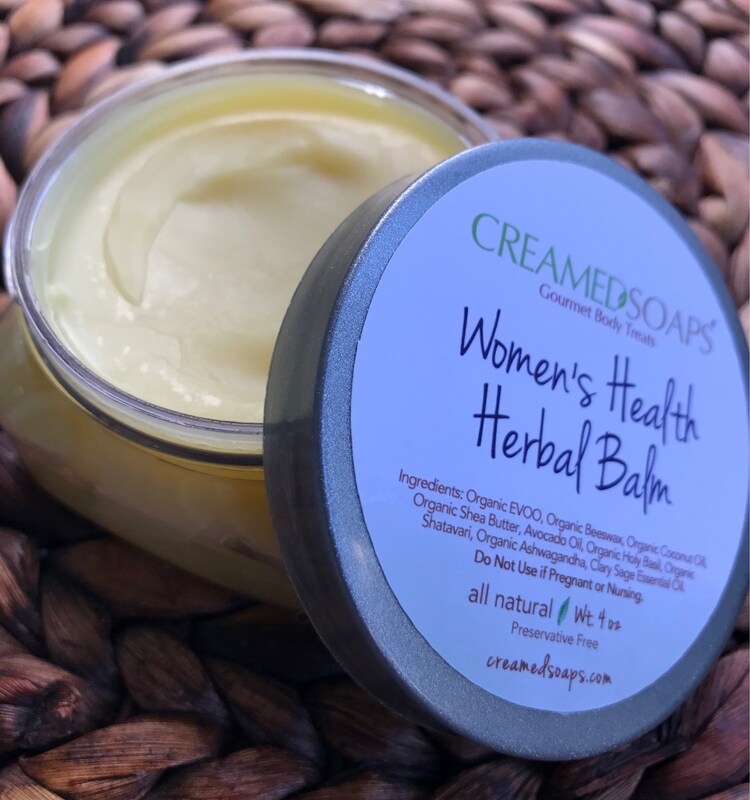 This balm features three adaptogenic (anti-stress agents) organic herbs chosen with you in mind...And now it is available WHOLESALE! 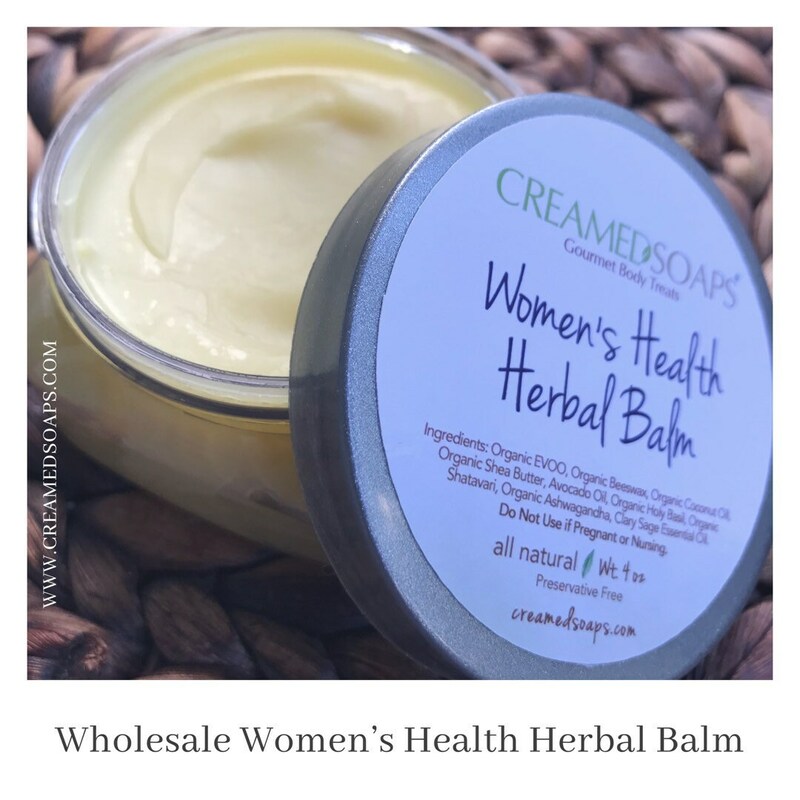 This listing gives you (12) 4oz Herbal infused balms. Each balm will come complete with CreamedSoaps branding! Ready to sale! Organic Ashwagandha, also known as Indian Ginseng, was chosen for it's properties that promote a healthy immune system and for it's popularity as an anti-stress agent. Applied topically it helps to reduce inflammation. This adapotgenic herb is praised for it's role in supporting women's health. Organic Shatavari, is related to Asparagus. It is considered one of the most important herbs for women's health. It is known to support female hormone levels, a healthy libido, the reproductive organs and has a calming grounding effect. Organic Holy Basil - Rama, offers leaves that smell of peppermint, cloves, licorice and/or lemon. This herb belongs to the mint family and is a cousin to Basil. Mostly used today in Tea, it is known as a natural remedy for anxiety, adrenal fatigue, hypothyroidism, unbalanced blood sugar and acne. All three of these herbs have been infused in Organic EVOO. The oil was then combined with Avocado Oil, Organic Coconut Oil, Organic Shea Butter and Organic Beeswax. Lastly the essential oil, Clary Sage was added to round out this stress relieving Balm. Long considered a "woman's oil", Clary Sage's benefits lie in its calming influence on the body and mind, along with supporting emotional and feminine functions. Clary sage is proven to be most useful when calm and relaxed states are needed in our high stress, fast paced society.